Some of the most energetic explosions in the Universe, short gamma-ray bursts, might be caused by the merger of two compact objects. These two papers appeared within a few days of one another and in both of them, the authors observe the light coming from the location where the explosion took place a few days before to test that scenario. What is a short duration gamma-ray burst? Gamma-ray bursts (GRBs) are the most energetic explosions in the Universe. They come in two flavors: short duration and long duration, lasting below and above ~2 seconds, respectively. 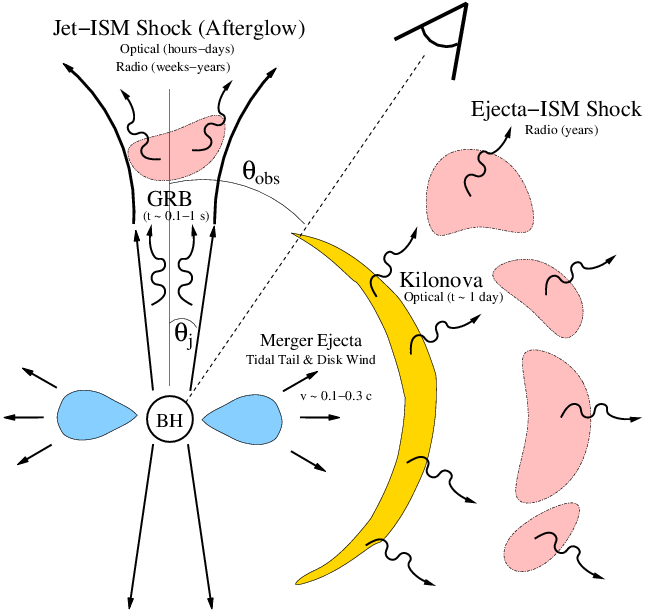 Long GRBs are typically followed by an afterglow, emission of less energetic radiation (longer wavelengths than gamma-rays) by the electrons accelerated in the shock produced by the explosion. Short GRBs have been observed to have dimmer afterglows and to occur in different environments than long GRBs, which could be indicative of them having a separate physical origin. Short duration GRBs are thought to be caused by the accretion of surrounding gas into the black hole that forms in the merger of two compact objects, such as two neutron stars or a pair of neutron star and black hole, while long GRBs have been associated with supernovae. When two compact objects merge, neutron rich gas can be ejected (see the cartoon below). This material undergoes rapid neutron capture (“r”-process), creating heavy elements from merger of original nuclei with the available neutrons. When those elements undergo radioactive decay, they emit light in the optical and near-infrared bands of the electromagnetic spectrum. The energy emitted can reach 1000 times the energy emitted in a nova (several orders of magnitude below the energy emitted by a supernova at its peak), hence the name “kilo”-nova. In this scenario, the inspiraling neutron stars would emit gravitational waves, thus kilonova emission could be possible a way to identify a counterpart to detected gravitational waves. A cartoon of the electromagnetic radiation emitted by a black hole after the merger of two compact objects. The GRB is produced by the shock generated after the accretion of material into the black hole. The kilonova is produced by radioactive decay of the ejecta around the black hole. The pink blobs represent the circumburst medium. These authors showed that the kilonova emission would actually last longer and be redder than quoted in this figure. Figure 1 of Metzger & Berger. The idea of looking for the signature of a kilonova to test the origin of short GRBs has been around for a while: several searches have been conducted in the optical range of the electromagnetic spectrum. However, only recently have these authors suggested that the kilonova emission would last longer than previously thought and that it would rather be damped in the optical and peaked in the infrared due to absorption by heavy elements produced in the r-process. The papers we discuss today looked for a kilonova signature associated with a short GRB about 10 days after the burst. The burst (GRB130603B) took place in June 3rd and it was detected by the Swift and Konus-Wind telescopes. One minute after, it was observed by Swift/XRT in the X-rays to pinpoint its location with more precision. About 3 hours after the burst, a point source was identified in a galaxy at a redshift of about 0.3 and quickly faded away. Ten days later, the Hubble Space Telescope was pointed at the location of that source. The object was no longer visible in the optical, but a counterpart was found in the infrared. Was this the remainder of the emission in the afterglow? Or a signature of kilonova emission? Berger et al. measured the luminosity in the infrared and set upper limits on the optical luminosity. They found that the observed luminosity of the object was consistent with the the decay of the GRB afterglow. The color was slightly redder than expected, but still consistent with the afterglow decay. A scenario where the emission comes from a supernova was ruled out because the emission is too dim. Alternatively, the observations were also consistent with a kilonova model in which the ejected mass was of about 0.01 solar masses. Tanvir et al. similarly observed an infrared source at the location of GRB130603B and placed an upper limit on its optical luminosity. They found this limit to be consistent with an extrapolation of the decay rate of the afterglow (measured within a day after the burst) . Their afterglow decay rate is estimated to be slightly steeper than Berger et al.. They observed an excess of near infrared (see the figure below) emission in comparison to the expected emission of the fading afterglow consistent with a model for a kilonova. What is the next step? Tanvir et al. suggested repeating the infrared observation later on to assess whether the source was really transient in nature, which would be further confirmation of it being associated with GRB130603B. The position where the short GRB occured in its host galaxy, obtained with the Hubble Space Telescope. The left and right panel show the same galaxy in the optical and the infrared, respectively. In the right panel, Tanvir et al. detect a source in coincidence with the position of the short GRB. Figure 1 of Tanvir et al.